University of Nottingham > Blogs > People and Culture > Equality > Race Equality in Higher Education – What’s it got to do with you? Race Equality in Higher Education – What’s it got to do with you? 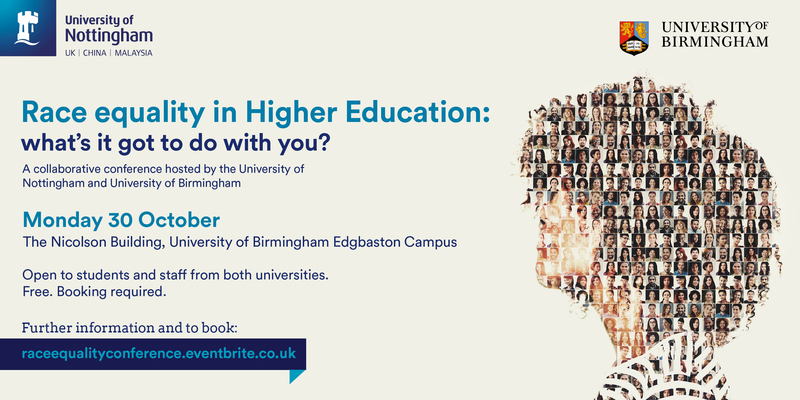 The Universities of Nottingham and Birmingham are delighted to announce a joint conference: ‘Race Equality in Higher Education – what’s it got to do with me?’ The conference will be held in the Nicolson Building, University of Birmingham Edgbaston Campus on Monday 30th October, 10:15am – 3:30pm. Melanie Joyner, Director of Student Services, Plymouth University to talk about the BAME student attainment gap. Members of BAME staff and student networks from each University, talking about their lived experiences. Tinu Cornish and Araria Sanusi from the Equality Challenge Unit, giving an overview of the current situation of race equality in HE, the background to the Race Equality Charter for HE and why it was introduced. Patrick Johnson, Head of Equality and Diversity at University of Manchester to talk about their successful application to the Race Equality Charter. We welcome both students and academic and professional staff from both institutions. The conference is free to attend with lunch and refreshments included. A free return coach will be provided for Nottingham delegates which will leave East Drive, University Park (Nottingham) at 8am and will return after 3.30pm.